The Hewlett's family values and culture were key elements to creating basic floor plan options that were both functional and aesthetically pleasing. Our concept sketches helped narrow down their wants, needs, and budget so they could start planning for their dream home. 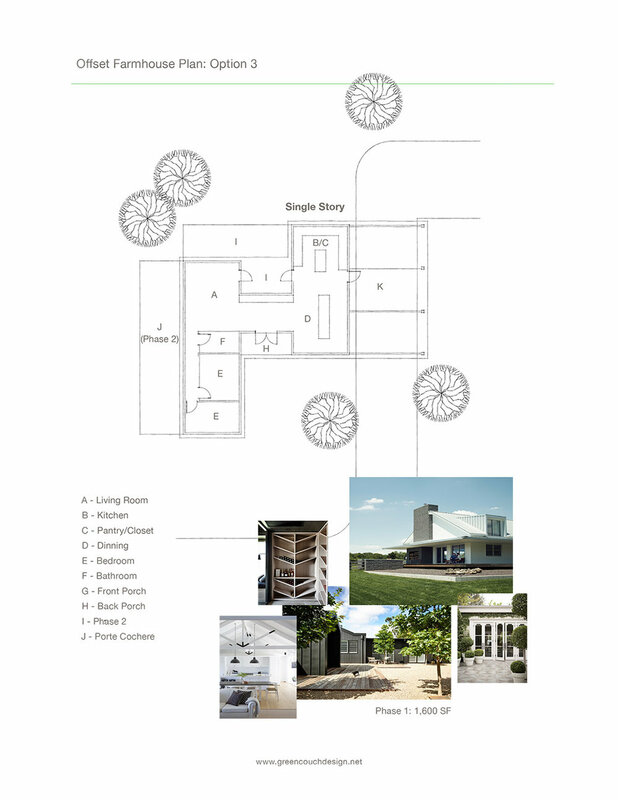 in developing a broad overview and plan for our dream home. They offered insights, thoughtful edits, and invaluable experience in creating an action plan moving forward." The Hewlett's wanted to build their dream house, but were not quite sure where to start. They were asking great questions such as: Can we afford what we really want? How much space do we need? How big is too big? Is an open floor plan too open? What is a realistic time frame? Do we need to hire an architect or a home builder? Can we save money by building in phases? Our Green Couch Design Basic Design Package was able to provide a framework so they could confidently plan for their future. Scale: Through a series of questionnaires we were able to hone in on the Hewlett's spatial needs. Ranging from 1,600-1,800 square feet, we developed three different sketches. By presenting a variety of options they could see just how much space was right for their family of four. Concept Sketches: Three basic floor plans were provided to bring insight and clarity to the overall function of the home. Each layout was simple, which enabled the Hwelett's to find similar layouts in other spec home designs or continue tweaking and creating a more custom solution with us. Either way, through our space design process the Hewlett Family confidently moved forward knowing how to prioritize each square foot of their home. Style: The Hewlett's wanted a French Farmhouse design with a fresh perspective. The overarching clean lines and shapes give the home a contemporary look while the facade and details of the home reflect a sence of tradition, character, and charm. Budget: The Hewlett's wanted to build a home they could develop in phases over time. First we helped them define their dream, and then together we prioritized a plan to achieve and execute their most immediate needs for their home.